The Berenstain Bears and the Christmas Angel by Mike Berenstain is a wonderful book for kids! I grew up with the Berenstains Bears and absolutely loved them so I'm happy their still around for my kids to enjoy! My kids love The Berenstain Bears and the Christmas Angel by Mike Berenstain and have been asking to read it just about every night before bed. I love that in The Berenstain Bears and the Christmas Angel my kids learn through Mama and Papa bear about some very special angels and the work they do for God. The illustrations throughout this book are wonderful and remind me of reading Berenstain Bears books as a child. I think I enjoy reading this book just about as much as my kids enjoy listening to it! 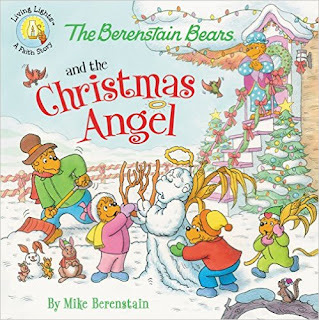 The Berenstain Bears and the Christmas Angel by Mike Berenstain would make a wonderful gift this Christmas and I'm sure it will bring your family just as much joy as it brings mine! You can find The Berenstain Bears and the Christmas Angel by Mike Berenstain on Amazon, Barnes and Noble and other bookstores.